Source: CICH graphics created using data adapted from the Canadian Incidence Study of Reported Child Abuse and Neglect, 2008. http://www.phac-aspc.gc.ca/cm-vee/csca-ecve/2008/assets/pdf/cis-2008_report_eng.pdf – accessed July 21, 2017. 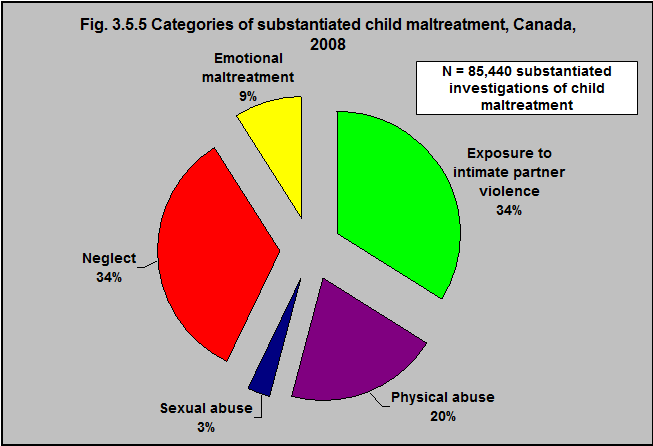 According to the Canadian Incidence Study of Reported Child Abuse and Neglect1, there were over 85,000 substantiated investigations of child maltreatment/neglect in Canada in 2008. 34% were neglect and 34% were exposure to intimate partner violence. 1Canadian Incidence Study of Reported Child Abuse and Neglect, 2008. http://www.phac-aspc.gc.ca/cm-vee/csca-ecve/2008/assets/pdf/cis-2008_report_eng.pdf-accessed July 21, 2017. 2Child Welfare Information Gateway. Long-Term Consequences of Child Abuse and Neglect. Factsheet. 2013 https://www.childwelfare.gov/pubPDFs/long_term_consequences.pdf -accessed July 26, 2017.